1. Dagger on the western side. 2. Pantacle on the eastern side. 3. Chalice on the northern side. 4. Wand on the southern side. 5. Book of the Law in the center. 6. Red candle on the north side of the book. 7. White candle on the south side of the book. 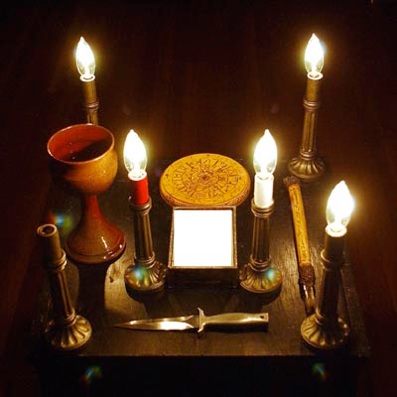 These items MUST be on the altar for it to be considered "Lycian," however, additional items can be added to these, as the need arises or is desired, and it still be considered a Lycian altar as it has the "essential" items that define it as such.